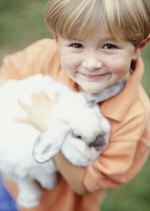 Rabbits can make fabulous pets and can provide excellent companionship when well-socialized. If you have a great female rabbit, it may be tempting to think about breeding her and sharing some of her amazing traits with others. Before you do, though, make sure that you understand rabbit reproduction, the responsibility you'll be taking on, and what to expect when your rabbit gives birth. In the wild, rabbits are prey animals. The House Rabbit Society explains that because of the extremely high rate of predation that rabbits experience in the wild, they simply produce litter after litter. Rabbits instinctively breed rapidly and give birth to litters quickly in order for the species to survive. While the strategy is effective in the wild, it can lead to rapid overpopulation when in captivity. Domesticated pet rabbits don't face the predation that wild rabbits experience, so their ability to quickly reproduce can overwhelm pet owners and breeders who aren't prepared for the multiple litters that can result in a short period of time. According to Tamil Nadu Agricultural University, rabbits reach sexual maturity very early in their lives. The male rabbit, referred to as a buck, is capable of breeding at eight months of age. Female rabbits, known as does, attain sexual maturity at various times depending on their breed size. Smaller-breed does may be ready to reproduce at three or four months of age, whereas larger-breed does are ready to reproduce closer to eight or nine months of age. Quality Cage Crafters states that rabbits are polyestrous and do not experience regular heat cycles. Rather than shedding eggs at regular intervals, a doe's ovulation is stimulated by the mating process. This means that rabbits have plenty of flexibility in terms of how frequently they breed and in what times of the year they mate. Many rabbits will mate year-round in more temperate areas. In areas that experience cold winters, though, does tend to be less receptive of males in the winter. Breeders may stimulate rabbits to mate through the use of heat lamps or artificial light. Does show a number of signs indicating that they are ready to breed. A doe may appear restless or rub her chin on her cage to show she is ready to breed. According to Tamil Nadu Agricultural University, rabbits tend to be more willing to mate in the early morning and in the early evening. Does who are receptive to bucks will lift their tails and allow the bucks to mount them. In some cases, the mating process is almost immediate. If you are breeding rabbits, you should always take the doe to the buck's cage for breeding. Putting the buck in the doe's cage can lead to fighting since mature does are highly territorial. If a doe isn't receptive, then return her to her cage and try again another time. Does ovulate between 10 and 13 hours after they have mated. This often means that breedings frequently result in pregnancies. According to the House Rabbit Society, it also means that a female can become pregnant again within 24 hours of giving birth as long as a male is present. Quality Cage Crafters explains that rabbits have a gestation period lasting between 28 and 34 days, though most rabbits give birth on the 31st day. You should give your doe a nesting box in her cage around day 26, and she will start to pull out some of her fur to line the box. You can also line the box with wood shavings and grass hay. Provide the doe with plenty of fresh hay and water as well as her pellet feed during the last few days of pregnancy. Try to avoid any environmental stressors, like loud noises, that can scare and stress the doe. According to Quality Cage Crafters, you should carefully look at the nest box once per day without disturbing it. Just look for movement. Once the babies, or kits, have been born, you'll be able to see the nest moving. Rabbits often give birth late at night or early in the morning. In the first 24 hours, check on the kits and remove any placenta or dead kits from the nest. The kits should be clean and dry. Kits are born naked, blind, and deaf, and they're highly vulnerable when young. The doe will nurse her kits twice a day for between 5 and 10 minutes each time. Be sure not to disturb the nest while the doe is nursing. According to the MSPCA Angell, a typical rabbit litter size consists of between four and 12 kits. Because the rabbit gestation period is only 30 days, and rabbits can produce so early in life, a single female rabbit could go on to have over 800 children, grandchildren, and great-grandchildren in her lifetime. Quality Cage Crafters notes that young kits grow at an astoundingly fast rate. Within just 24 hours, you will notice that the kits have increased in size, and they will soon start to grow fur. As long as your doe is familiar with you, she shouldn't mind you checking on the kits and handling them briefly. Look to make sure that the kits are dry and that they have round bellies. You can use a soft, dry towel to wipe off the kits if they are soiled or wet. You should notice more and more hair growth on the kits each day. As they grow older and stronger, they'll start to squeak and struggle as you handle them. According to Quality Cage Crafters, the kits will start to open their eyes by the time that they're 10 to 12 days old. Kits can and will urinate on each other while in the nest box, and this can cause a condition called "nest box eye" that will cause some eye irritation. Change out the nest box litter to help resolve this condition. Once the kits are large and strong enough to explore, you can turn over the nest box and allow them to move around the cage. Young kits will crawl around as they learn to hop and will start to eat solid foods and drink water. At three weeks old, the babies will live fully outside of the nest box. They'll rest and nap a lot but will also have lots of energy. It's important to make sure that the cage is large enough to accommodate the doe and all of the kits, especially if she had a large litter. Tamil Nadu Agricultural University states that kits can live without their mother's milk by the time they are 21 days old. Quality Cage Crafters suggests that you wean the kits closer to five-and-a-half to six weeks. Larger breeds are slower to mature, so they may not be ready to be weaned until they are eight weeks old. Weaning should be a somewhat gradual process. You may want to separate the kits into another cage during the day and then return them to their mother at night. After repeating this process for two or three days, you can separate the kits fully. If possible, keep the kits together for a week or two after you've weaned them. This offers them support and makes the transition a bit easier. If you're planning to sell the kits, this is the point at which you can begin to advertise them, but in many areas, you aren't allowed to sell kits who are less than eight weeks old. It's important to realize that things can go wrong with rabbit reproduction. According to the House Rabbit Society, a doe may be confused during her pregnancy and may not build a nest. This can cause the kits to die of exposure. Additionally, a doe may not produce milk, or she may not feed her babies. In this case, human intervention is necessary to save the kits. Unfortunately, hand-fed kits face an extremely high mortality rate, so it may not be possible to save the litter. If a doe was bred to a buck that was larger than she is, she may have trouble delivering the kits, and the kits may not survive. It's also possible for a doe to become sick due to the stress she undergoes when carrying and delivering the kits. You shouldn't make the decision to breed rabbits lightly. Breeding rabbits brings with it a big responsibility, and you will need the time, money, and space to house all of the rabbits safely. If you enjoy having rabbits as pets, it may be a wiser and lower-stress choice to simply continue to raise your rabbits as pets rather than as breeding stock. 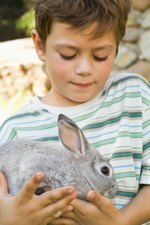 If you are considering breeding, then the House Rabbit Society urges you to consider the issue of unwanted domesticated rabbits in the United States. Shelters often have many rabbits in need of homes, so breeding can increase this issue. If you ultimately do decide to breed, then you should do plenty of research on how to select appropriate stock, how to raise the young rabbits, and how to find homes for them. It may be best to find an experienced breeder who can help you through the process and who can be on hand to answer questions. Should you decide not to breed your rabbits, the House Rabbit Society suggests that you spay or neuter them. Spaying a female rabbit eliminates the possibility that she will develop ovarian, uterine, or mammary tumors, potentially lengthening her life. Spaying or neutering brings other benefits, too. Fixed rabbits tend to be less aggressive and have more reliable litter box habits. When your rabbits are spayed or neutered, you can have both males and females together without worrying about an unexpected or unwanted litter. Before you breed rabbits, you will need to come up with a plan for how you will find homes for the four to 12 kits. According to the House Rabbit Society, it's also important to think about what you will do if you can't find homes for the kits. Spaying and neutering multiple rabbits can get expensive, and caring for multiple rabbits for eight to 10 years can be a big undertaking. While breeding rabbits can be fun and exciting, the kits grow up quickly. Be a responsible breeder and work with quality stock, have a plan for the kits, and spend the time to understand all of the implications of breeding before you get started.